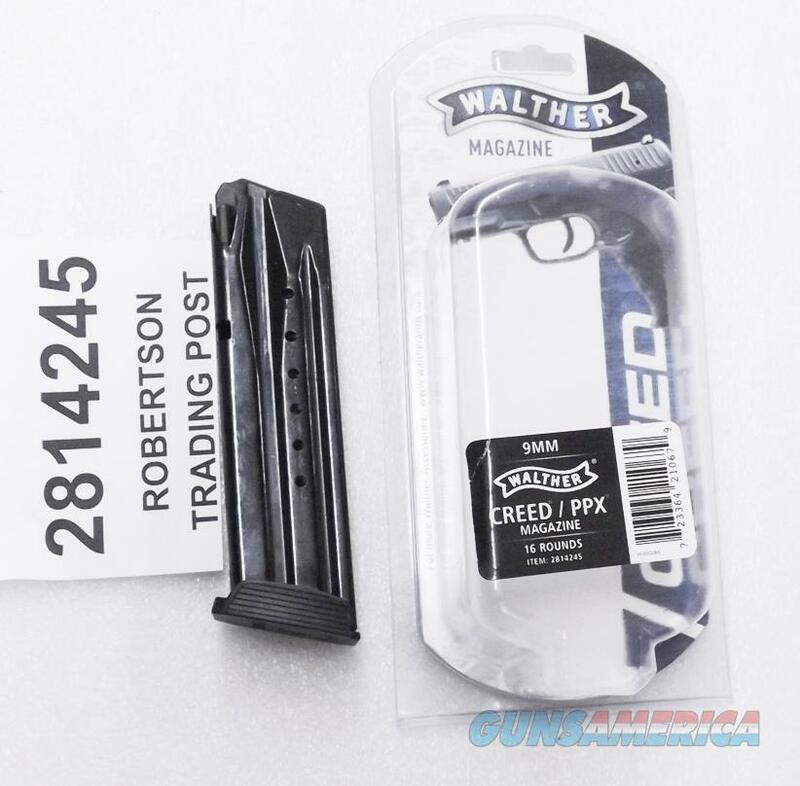 Walther Arms model PPX Creed 9mm Factory 16 Shot Magazine 2814245 New Blue Steel Buy 3 Ships Free! Description: Restrictions apply on high capacity magazines in many jurisdictions, so please read this entire ad carefully before bidding or offering to buy. This listing is for ONE Magazine. Buy any combination of 3 non gun non ammo items, and shipping is Free for the entire order lower 48. Here is Walther’s standard high capacity magazine for its Creed or PPX series pistols chambered in 9mm. Manufacturer is Mec-Gar s.p.a. of Brescia, Italy, under contract to Carl Walther GmbH of Arnsberg, Germany. Importer and warrantor is Walther Arms, Inc., of Fort Smith, AR. Construction is serrated side steel body with lateral round count ports, milled welded rear surface, steel spring and inner plate, and high impact polymer cartridge follower and floorplate. Finish is polished blue steel and semi gloss polymer. Each magazine holds 16 rounds of 9mm ammunition: 9mm Parabellum, 9mm Luger, 9x19, call it what you will, THE 9mm. This magazine will only fit a Walther PPX or Creed series pistol chambered in 9mm. It will not fit any other firearms. Each magazine comes in its factory packaging with waltherarms com printed material. Replacement pricing is $42.00 plus shipping on waltherarms’s store. We’re offering the 16 round Walther PPX 9mm Mags in the photos, however, or their identical mates, each	for only	$ 29.00. Not for sale to civilian residents of Aurora IL, California, Chicago Cook Co. IL, Colorado, Connecticut, District of Colombia, Hawaii, Maryland, Massachusetts, New Jersey, or New York. We had 10 round compliant magazines for those jurisdictions at press time on this ad, same low price. >>>>>>>>>>>>>>>>>>>>>>>>>>>>>>>>>>>>>>>>>>$3 Lower 48 First Class Mail Padded Envelope; $10 Priority to AK HI PR. First Class sometimes requires removing the item from its package.